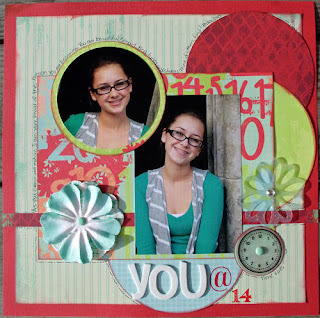 Blog Quick Quotes: Michelle & Theresa - amazing projects! Michelle & Theresa - amazing projects! Here is a cute layout & canvas idea from our DT. When we were at Disney last year, My oldest daughter and I had in impromptu photo shoot. I loved the pictures we took and have been holding on to them for the perfect papers. 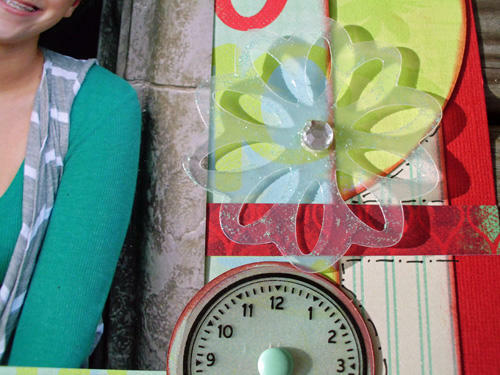 The Savvy Davvy paper line from Quick Quotes is my new favorite paper line and also the perfect papers for these photos! I used a Frosted Flower and added stickles to make it sparkly. I cut Circles and layered them under a central rectangle. The journaling is hand written around the circles and the outer edge of the rectangle along with some doodling and I added the clock to represent how quickly time is going by. Supplies used: Quick Quotes Savvy Davvy Paper line, Quick Quotes Frosted Flowers, Quick Quotes Maraschino Cherry Powderpuff Ink Pad, Stickles, Prima Flowers, Basic Grey Brads, Maya Road Plastic clock, American Crafts Thickers and Rubons, Jenni Bowlin Studios Number rubons, Journaling Pen. This was my first attempt at a canvas project (other than the mini book canvas kits) and I have to say I Love the way it turned out and I already have another in the works, lol! I went to my very first Private Reserve also (boy lots of first here, lol) and all I can say is if you Ever get a chance to go to one, YOU MUST GO! I got to go to the Atlanta, GA Private Reserve and had a BLAST! Busy the whole time I was there and this was one of the projects that we did! It is done with a 10 x 10 Canvas. I swayed from the actual directions with the kit and this is what I “re-did” to show you one variation of it! The inks I used were Amaretto and Mocha Mama PowderPuff Chalk Inks (two of my much loved colors) The Paper line that is used on the canvas and in the kit is the Damsel in Distress line and the chipboard pieces were cut just for this kit. Actually the chipboard corner pieces at the top are the negative pieces from the frames that I cut apart and stacked with some bling for extra dimension (I can‘t throw anything away, lol)! The extras I used were minimal, Flowers: Recollections from Michael’s and Bling Swirl: Forever in Time and additional Bling: Hobby Lobby. The feather’s are just some I had in my stash. That’s it, very minimal extras and actually the kit came with some Frosted Butterflies that I didn’t use along with a few extra flourishes that I can add to another project. Hope you enjoy it as much as I did creating it! THERESA has a great tutorial on an easy way to transfer bling. Beautiful projects ladies! Michelle, I just love how wonderfully the whole layout works! Theresa...you are a canvas pro! Your project is precious! Thank you both for your wonderful inspiration!